I recently finished teaching my first session of a new eight week lecture style class I developed for the Providence Art Club: Art History & Appreciation. I proposed the class because I genuinely believe that a good grounding in the basic history of art can go a long way in helping individuals to develop better connoisseurship skills. It was the first time such a class was offered at the Club and I hoped it would garner enough interest to get the ten or so students needed to run it. Nearly forty students signed up. Over eight weeks, and nearly 300 slides, we covered everything from the Cave Paintings of Lascaux to the use of art in Beyoncé and Jay-Z's new music video. It was a great experience for me as a teacher. And a great reminder to me of the incredible value of art history. Regularly ranked as one of the least useful, least marketable, least valuable college majors, art history is often used as shorthand for a wasteful course of study. Mocked even by then President Barack Obama, who in 2014 reminded an audience that you can often make more money from a career in a skilled trade than as an art historian. Art historians are portrayed as alternatively icy, stodgy, and elitist in the popular culture. In spite of the negativity surrounding the discipline, it still draws in students at all levels. But what value does it actually have? 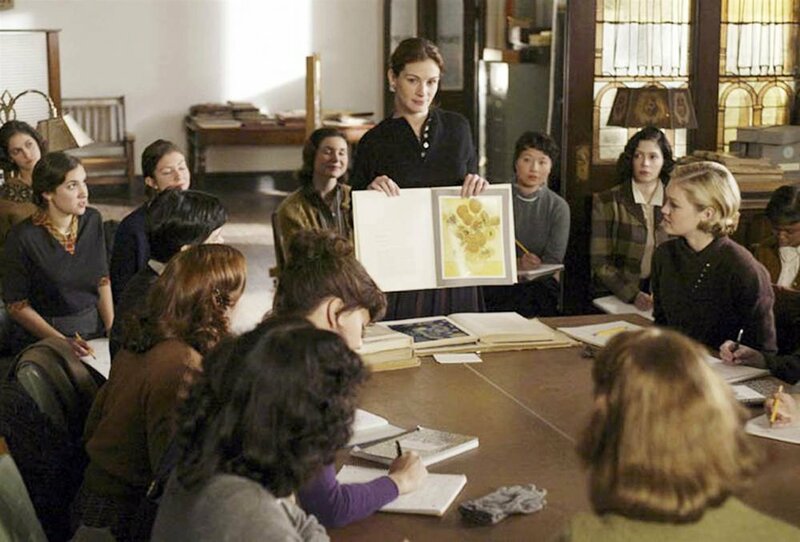 Still from the 2003 film Mona Lisa Smile, about a professor who uses art history to challenge her students assumptions at the conservative Wellesley College of the 1950s, starring Julia Roberts. The study of works of art is not just about determining whether a painting is by Bruegel or Bacon. First and foremost, art history has power to create empathy and lead to a better understanding of and appreciation for cultures, traditions, and beliefs other than one's own. Art history also builds remarkable analytical and writing skills, born out of the thoughtful consideration of the historical context for a work and paired with a dedicated examination of the object in question. Additionally, studying artworks builds the skills needed to critically process the ever-broadening flow of visual media that comes with contemporary life. In short, studying art history enables closer looking and deeper thinking. They say that "history is another country", and that although there may be vague commonalities between historic cultures and today's world, it can be difficult for modern audiences to ever truly understand the motivations, attitudes, and values of people living in England during the sixteenth century, or in France during the eighteenth. But through looking at, and deeply examining, the exacting portraits of Tudor courtiers or the lush paintings of the French Rococo it might be possible to gain a better footing in these foreign worlds. And in the process to also hopefully learn something about abuse of power, or despotism, or revolution. More than the rote collecting of facts or points of view, art history stokes continued curiosity about the subjects, techniques, philosophies, and personalities that have shaped visual culture and history. It enables viewers to explore and question the world around them, and to do so with a critical eye. Teaching Art History & Appreciation reminded me of all the reasons I love this discipline. The skills developed through looking at works of art are easily transferred to the examination of other media. Honing one's eye on great works of art cultivates stronger cross-disciplinary understanding of architecture, film, and design. Talking students through the history of art helped me to better develop my own capacity to see these and other connections, to understand them, and to share them passionately and accessibly with my students. One of my favorite quotes about education is attributed to Plutarch and goes something like "The mind is not a vessel to be filled, but a fire to be kindled." In teaching Art History & Appreciation, I had a great opportunity to reflect on the capacity of art history to motivate curiosity and connoisseurship in contemporary viewers and collectors. By walking my students through the history of art, I think and hope that I inspired a better appreciation for the rich complexities of the artworks of the past as well as a better ability to read and understand artworks of the present. At the end of the last class one of my students came up and said that the course had "lit a spark" in her and inspired a more keen interest in art history. I guess then, according to Plutarch at least, I did a decent job. I'm looking forward to teach Art History & Appreciation again in the future, and am currently writing the syllabus for a followup class on Modern and Contemporary Art. For more information on my teaching projects, visit my Speaking & Teaching page.